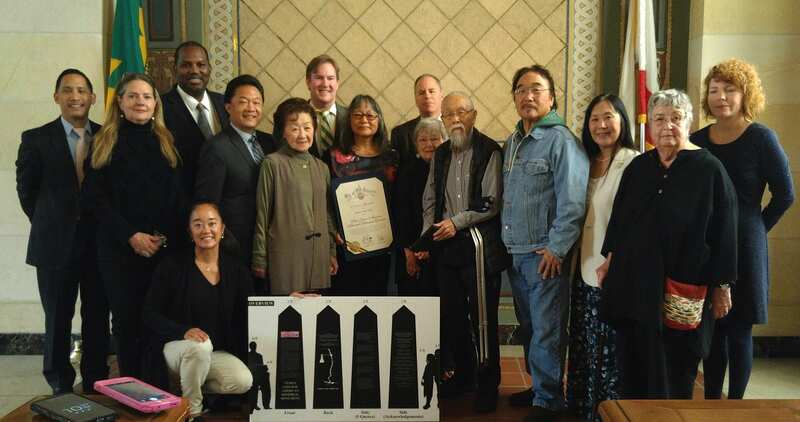 On behalf of the City of Los Angeles Board of Public Works, Commissioner Joel Jacinto presented to members of the Venice Japanese American Memorial Monument Committee on May 26 a Certificate of Recognition. Commissioner Joel Jacinto reads the BPW Certificate of Recognition to the VJAMM Committee into the public record. 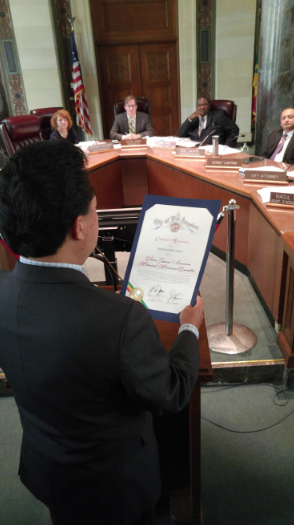 Jacinto spoke at the VJAMM dedication and invited the VJAMM Committee to return to the Board of Public Works to be honored as part of its celebration of May as Asian and Pacific American Heritage Month. Commission President Pro Tempore Michael Davis eloquently addressed the VJMM Committee: “Today I want to commend the entire Venice Japanese American Memorial Monument committee for the work that they have done, and not only putting together [a]dynamic monument that tells a story that many in this city may not have not known about. But through the work that you have done, you represent what it means to experience the American Dream. . . .
“As we all, who have had experiences as minority cultures in this country, have encountered these challenges, one of the things that has become very apparent and that clearly is, that there is more that unites us in different cultures than that [which]divides us . . .